Thinking of making a difference at your high school and in your community? CORE is a unique opportunity for students to become a family, learn outside the classroom and gain 21st century skills. Cultivating, Organic Recycling Environmentalist is a Green that guides at risk students through their high school years. Students take a series of work experience classes that help students prepare for jobs out of high school and introduce students to skills that they will learn more about in college. Click here to find out more about a California Partnership Academy. CORE Academy is a community of students, teachers, business partners and their families working to move the world toward sustainability. By employing a full spectrum of learning experience, from classroom to work site, CORE will provide students with skills and motivation to connect the high school experience to a future as sustainable economy professionals. What are CORE courses? How are they different? As a CORE student you will be enrolled in 4 CORE classes: CORE science, CORE History, CORE English, and depending on your year CORE math. 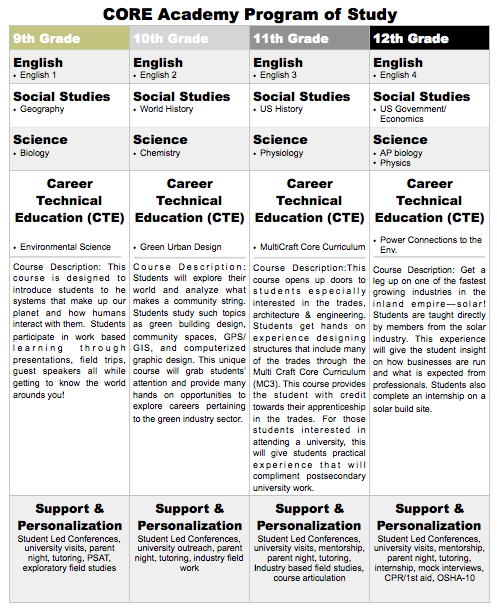 These are the same courses that all students take (biology, English 1, world history, etc) the difference is that teachers teach with a career theme in mind. CORE teachers also work very closely together and link our classes so that your learning is integrated,, meaning your English teacher will work with your history or science teacher to teach those subjects. Why do I have to take the CORE CTE class? Part of being in a California Partnership Academy is that you are being trained in industry skills that will help students get a job after high school while attending college. One of the major benefits of being a CORE student is that you take the CORE electives. These are recognized as college preparatory classes when you apply to UC or CSU schools as science courses. CORE students can proudly show off their transcripts because they show 7 years of a-g science courses. The average student has 3-4 years!! CORE students put their learning into practice through mentoring programs in the CORE elective class their junior year. Guest speakers come in and speak with students about careers in landscape architecture, urban planning, sustainable landscapes management, energy audits and building retrofitting. All students are trained in concepts in these fields. As a senior in the CORE academy you have opportunities to work in the community and gain work experience in demanding fields such as architecture, landscape architecture, building retrofitting and alternative energy generation.